Hi there! Today I’m sharing a review for a new contemporary M/M romance from Indra Vaughn. 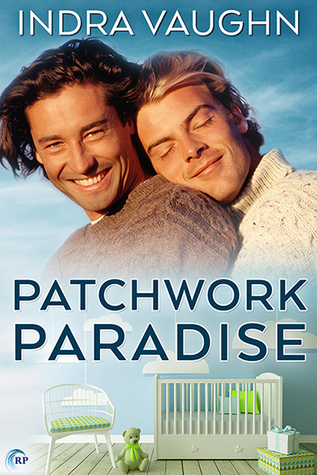 PATCHWORK PARADISE is a friends-to-lovers story about a man who survives the death of his love–and find love again in ways he never expected. Ollie and Sam are childhood friends and have been boyfriends for a decade–their whole adult lives. They live together in a house Sam inherited from his grandmother, and look forward to their wedding in a month. Then Sam is killed by a mugger and Ollie’s life dives into the deep, dark, depression end. We really get a sense of Ollie’s loss, as he struggles to get out of bed, exist alone, walk through the house where he and Sam planned their lives out. It’s truly heart-wrenching. Ollie and Sam’s mutual friends try to get Ollie moving on. Thomas, in particular, isn’t happy that Cleo is pushing Ollie to date again–even six months after Sam was laid to rest. Ollie isn’t sure what the subtext of that frustration is, but he’s also not sure that he should be dating again. He’d thought Sam was his one true love, and even making a connection with another man leaves him weeping. Thing is, Ollie never did see the way Thomas looked at him–as someone he always wanted to date. They’ve been friends for five years, and Thomas has dated more men–and women–than Ollie can count. Just when Ollie has the courage to talk with Thomas about their misunderstanding, Thomas decides to take off for a six-month tour around Europe. He and Ollie maintain constant contact via the phone, but things get messy when Thomas finds a companion. And when that seems to fizzle, well, there’s another complication–in the form of Thomas’ unexpected newborn son, Milo. Thomas is a wreck, and Milo’s mom is a wreck, but neither of them want anything much to do with the other despite their unplanned child. That said, Milo’s mom is experiencing post-partum depression and needs Thomas to care for Milo–enter Ollie to the rescue. Of sorts. He’s got a big empty house, and his mother’s able to child-sit. That said, Ollie’s charmed by the little screamer, and having both Thomas and Milo under his roof allows him to re-envision his life. Sam had never wanted children, and Ollie thought he was comfortable with that. Helping Thomas care for Milo gives Ollie a glimpse of parenthood he’d never had–and he discovers he truly wants it. There are some money considerations, not the least of which is Sam’s parents who want Sam’s house to be sold, and it’s one issue too many for Ollie and Thomas to overcome, perhaps. These guys have known each other for years, might could love one another, share a house and child-care duty–and yet have NEVER been on a date together. So, yeah, everything backwards. The sexual tension is really high, and the slow burn pulls us through Ollie’s despair and depression, and Thomas’ anxiety, giving a hopefulness to the story that I really needed. Also, Ollie is a scream as a pseudo-daddy. I definitely enjoyed his novice caregiving perspective, and how willing he was to accept both Thomas and Milo into his life. Ollie’s such a sweet soul, and his grief is so acutely rendered that I sank right into it. I also loved the little insights I gleaned of Belgium, which was a unique setting for me as a reader. Thomas is a good man, and he never pressured Ollie to move on, or to love him, despite his own intense feelings for Ollie. Neither man wants to ruin their friendship, and the tentative steps they make toward becoming lovers are tender and well-considered. Interested? You can find PATCHWORK PARADISE on Goodreads, Riptide Publishing, Amazon, Barnes & Noble, and AllRomance. I received a review copy of this book via NetGalley. The stories of boys and their unrequited love will no doubt keep finding their way onto the page–and hopefully into readers hands–even if it takes a little more time. You can catch up with Indra on her website, Facebook and twitter.